There wasn't much for a blind man to do but beg in those days. Josiah, at least, had a good high-traffic spot near the healing pool. Blind from birth, Josiah didn't complain about his lot. Could be worse. At least he didn't have leprosy. One day, Josiah overheard some strangers talking nearby, one saying he proposed to use Josiah. Suddenly, there was mud on his eyelids. "WTF?" thought Josiah, "That's spit!" He got up, stumbled down the steps to the pool, washed off the mud, and discovered he could, for the first time in his life, see! He didn't ask for it. He didn't know who his benefactor had been. Some guy named Jesus. He didn't even know what to do, so, at first, he went back to his usual begging spot, but folks pretty quickly took note that the old blind guy could see. Word got around. The authorities heard about it. They dragged him into court. They interrogated his parents. They accused him of fraud. Even though they all knew, at heart, that the blind had been made to see. He simply told the facts. "One thing I know, that, whereas I was blind, now I see." Then he told the truth. 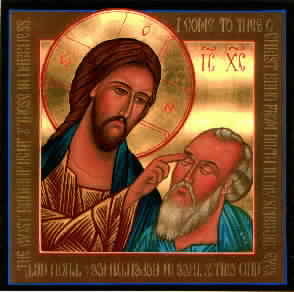 "Since the world began was it not heard that any man opened the eyes of one that was born blind. If this man were not of God, he could do nothing." They couldn't handle the truth. Jesus picked a pretty good messenger. Why did Jesus put spit on the blind man? From a comment on Ace of Spades blog.